Summary of Chronic Obstruction Pulmonary Disease (COPD) COPD is a progressive lung disease characterised by dyspnoea, wheezing, chest tightness and cough. COPD is an umbrella term for a number of lung disease, two common types being emphysema and chronic bronchitis. Smoking, air pollution and certain occupations are risk factors. 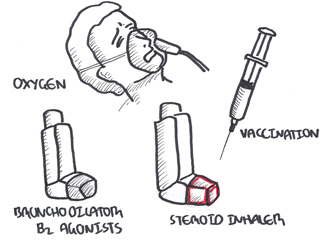 COPD is an obstructive disorder and so the use of bronchodilator can alleviate symptoms and improve lung function. Overview The diagnosis of COPD is usually limited to individuals who have chronic airflow obstruction associated with tobacco smoke or some other noxious inhalant, and it is usually not difficult to distinguish it from other causes of chronic airflow obstruction. The most commonly associated clinical disorders associated with COPD are emphysema and chronic bronchitis. 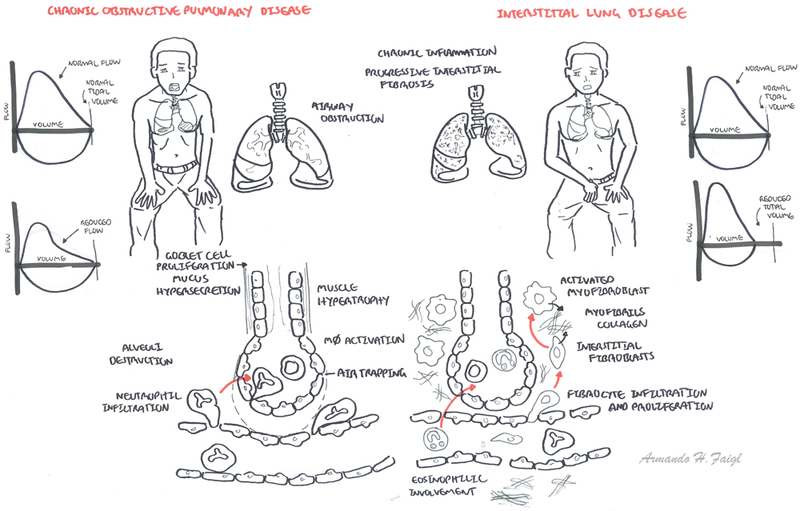 Restrictive Lung Disease: Unable to fully fill the lungs with air. Their lungs are restricted from fully expanding. 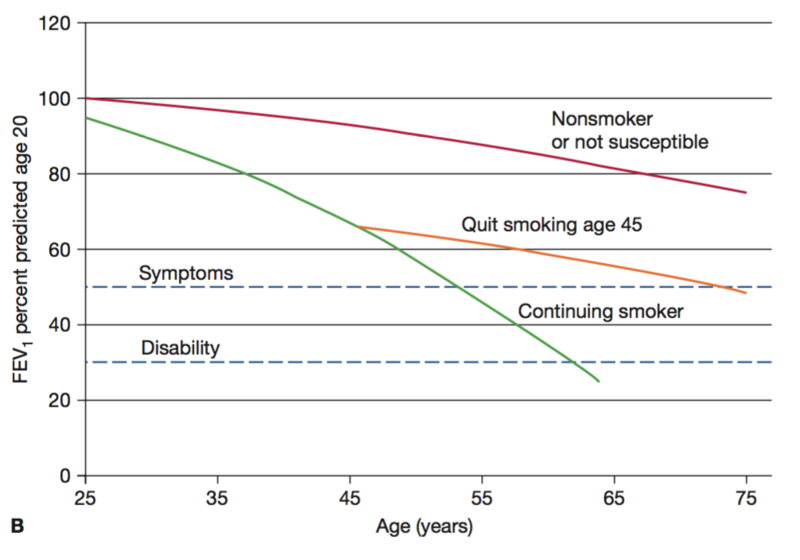 Major risk factors for COPD are smoking, enviornmental (ie. air pollution) and occupational history (ie. coal mining). 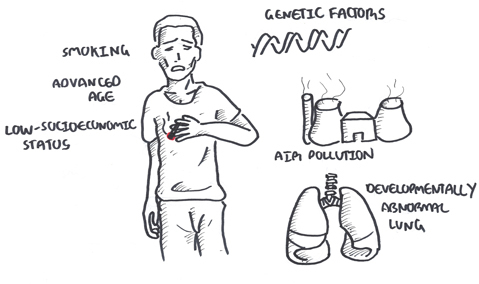 The amount and duration of smoking/fumes/gas exposure contribute to disease severity. COPD results from an increase in the rate of decline in lung function over time. Natural history of the decline in FEV1 overtime. Comparing a hypothetical non-smoker, smoker and ex-smoker. Quitting smoking can slow progression to COPD by 50%. 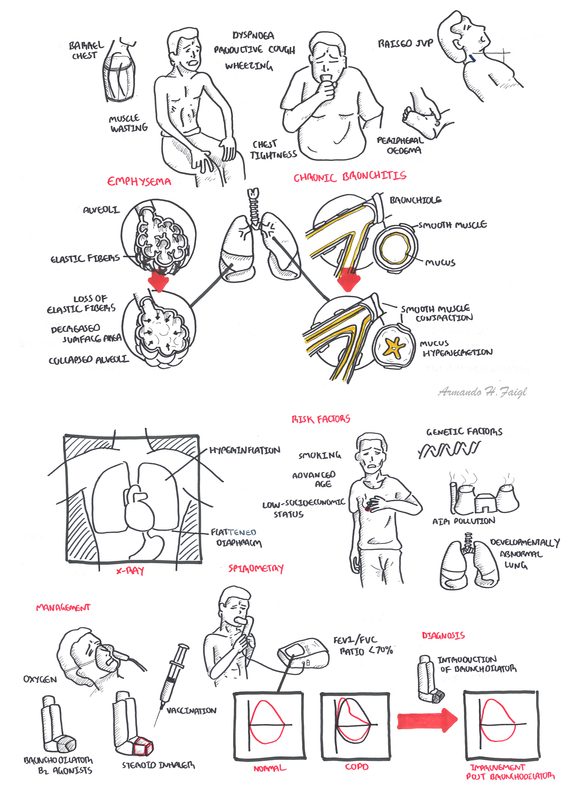 Investigations Chest X-ray (CXR) is essential in ruling out differentials and help confirm COPD. A CXR may reveal hyperinflation and a flattened diaphragm. Spirometry is for diagnosing and monitoring disease. 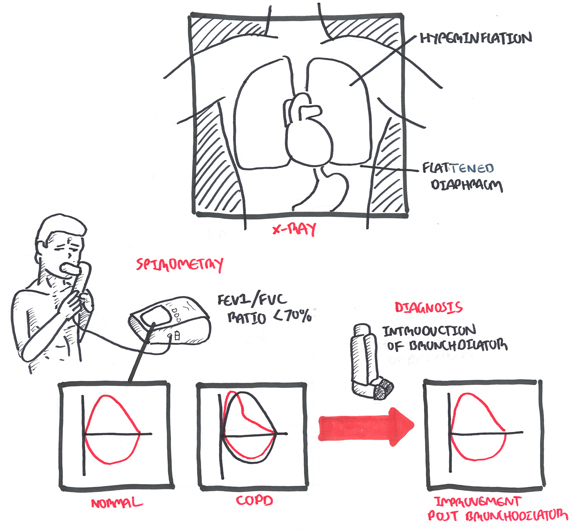 COPD is diagnosed when FEV1/FVC ratio is below 70% and improves with introduction of a bronchodilator. Defined Pathologically Dilation and destruction of air spaces distal to the terminal bronchiole without obvious fibrosis. Decreased elastic recoil of alveoli causing decreased expiratory driving pressure, airway collapse and air trapping. Left Image Pure emphysema effects the alveoli causing destruction of elastic fibers, decreasing surface area resulting in air trapping. Right Image Pure chronic bronchitis affects the respiratory tract leading to goblet cell proliferation, mucus hypersecretion and smooth muscle hypertrophy. However, typically people present with a mixture of emphysema and chronic bronchitis. Remember Smoking cessation and supplemental oxygen to treat chronic hypoxemia are the only medical therapies shown to decrease mortality among persons with chronic obstructive pulmonary disease. What are the 5 “A’s” of smoking cessation counseling? Remember The hallmark of restrictive lung disease is decreased lung capacities, particularly the TLC but also the vital capacity. Remember In both obstructive and restrictive lung disease, the FEV1 is decreased, the FEV1 /FVC is decreased in obstructive processes and normal in restrictive processes.